This article introduces a concept of digital lean that combines both traditional lean and new digital solutions. Based on my experience, understanding how these two elements are connected enables hospitals to lead related changes more effectively. 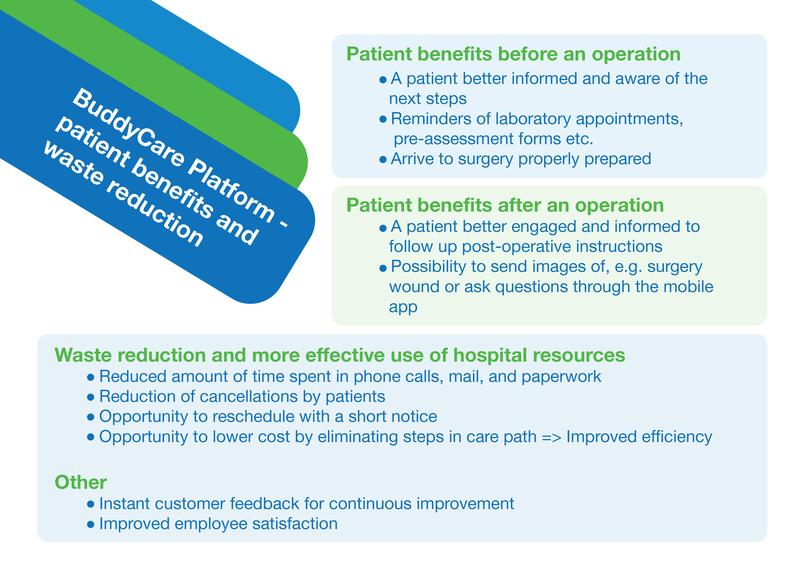 BuddyCare Platform is used as an example of new digital solutions. Hospitals have increasingly welcomed lean principles and methods not only to save money but also for many other benefits that application of lean could bring. Lean methods assist in reducing waiting times and access to the right care at the right time. Lean hospitals nurture the culture, where front line employees’ ideas are better visible and appreciated. While lean is in most cases positive, many healthcare organisations struggle to understand, how to link lean efforts and leadership. Lean should never be an exercise of various tools and one-off projects. Instead, lean should be incorporated at the center of hospital leadership and continuous improvement. 3. Clearly defined management system elements including KPIs. 4. We engage employees from the beginning and start building strong ownership and open dialogue from day one. While lean is getting a stronger foothold in healthcare operations, digitalisation is ready at the door. There are indications from industrial companies that integrating lean principles into digital transformation helps achieve radical simplification of processes and allows companies to unlock digital potential. If you want to explore more, we recommend to read Arthur D Little's article about Digital Lean management. I will further explore this idea of integrating lean methods and digital solutions for surgery patients and call it digital lean. There is an opportunity to bring more value for surgery patients when we assess patient journey from the preparation to recovery. The BuddyCare Platform captures this opportunity in a new way. It enables hospitals to simplify processes and to reduce waste. The Platform automates care coordination at the same time improving patient experience and communication. The BuddyCare Platform consists of patient's mobile application and healthcare professionals dashboard. The company's handy mobile application is an easy-to-use single channel communication method between hospital and patient. A patient can use it safely on his mobile phone or tablet. Care personnel uses the BuddyCare Dashboard that provides real-time visibility over the patient’s activities throughout the patient journey. Click here for more information on BuddyCare. Why digital lean makes sense? 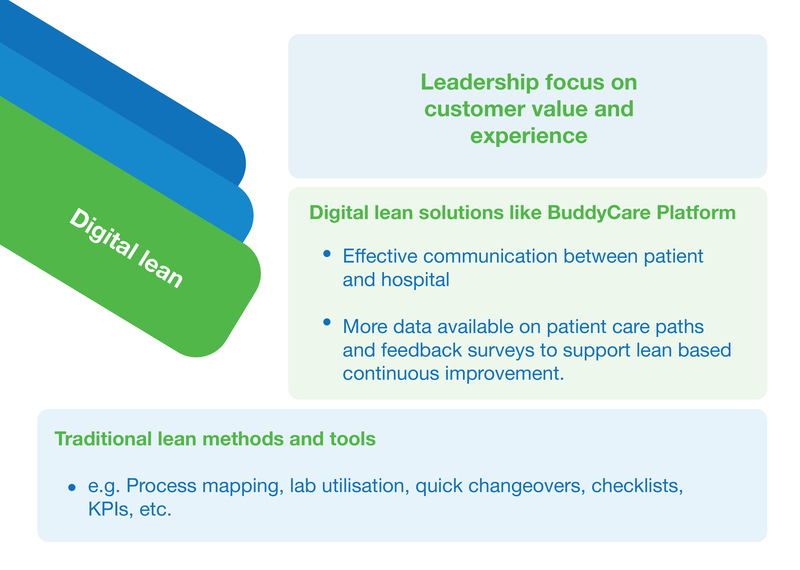 When a hospital has already relevant lean capabilities and lean management in place, implementing digital solutions like BuddyCare Platform, is more effective and above all related customer benefits and operational improvements are maximized. Would we build a digital solution on top of a process that has hidden problems, waste in various forms, unclear roles and responsibilities or lack of relevant standardisation, we run a risk of not getting results we targeted. In implementing a digital solution, we also need a clear and shared understanding, how renewed processes will look like, what new roles and responsibilities are needed. This is where lean methods are a real support. Role of leadership and management system elements is to ensure that improvements whether traditional or digital are bringing concrete customer and other operative benefits. BuddyCare Platform is just one example of a digital solution, but it is an excellent example of an opportunity to start exploring a new type of communication with patients. 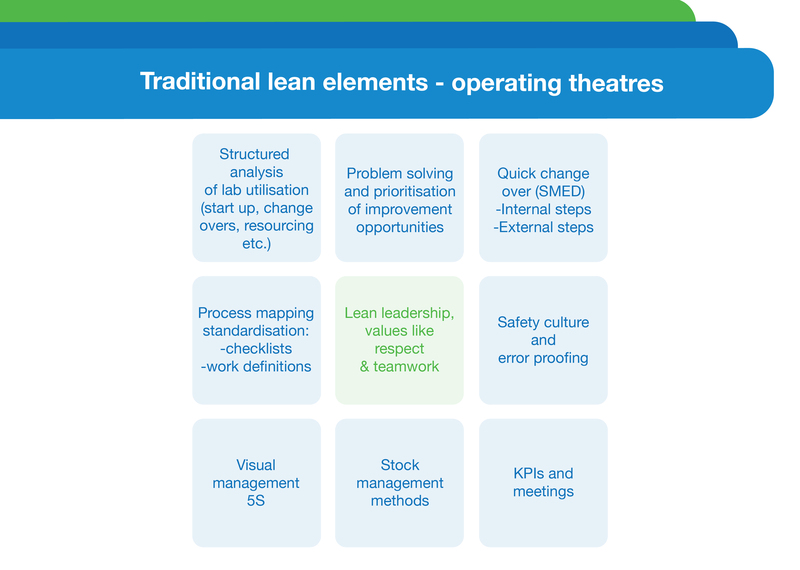 The way it is implemented by integrating lean principles could bring significant new capabilities for hospital organisations. While working with Buddy Healthcare, I realised that BuddyCare Platform is today mainly used for surgery patients. It is easy to see, that its benefits will not in future be limited to surgery patients. The writer of this blog article is Sari Kangas-Ikkala, who worked with Buddy Healthcare in a project to support the BuddyCare Platform deployment in hospitals. Saramis Oy provides lean based project management services for healthcare transformation and hospital projects. Last six years Sari has worked with major Finnish hospitals like Tampere Heart Hospital and Helsinki District Hospital (HUS). She has worked with several large HUS hospital projects including trauma, cancer, and psychiatric hospital projects. Sari has also worked with technology start up Buddy Healthcare and global diagnostic company Boston Scientific. Today she is working as lean expert in Vantaa community social and healthcare services focusing hospital and home-based rehabilitation care. How to guide breastfeeding mothers with mobile app?